Campaign collecting school supplies kicks off in Prince George’s Co.
Students and volunteers are working for the next three weeks to collect 15,000 backpacks and fill them with supplies for needy students ahead of the start of the school year in Prince George's County on Sept. 4. BOWIE, Md. 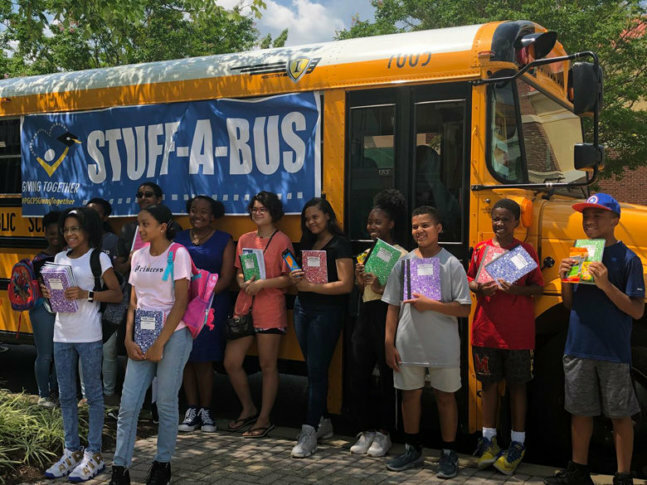 — Prince George’s County Public Schools has kicked off its Stuff-a-Bus school supply drive as students and volunteers gathered to collect the supplies at Bowie Town Center Sunday. The goal is to obtain 15,000 backpacks and fill them with supplies by Aug. 25. The backpacks will be distributed to students at Prince George’s Stadium, the home of the Bowie Baysox. The distribution will be a key part of the day’s 8th annual back-to-school block party. The campaign aims to keep kids stocked up and prepared to head back to school, which starts Sept. 4. David Hardy and Chance Turner were among the group of students collecting supplies. “It makes me feel good because it lets you give back to other people,” Turner said. Alexander Wallace, a member of the board of education for District 7, supported the initiative with a visit. “It’s a great opportunity for the entire Prince George’s County community to support the school system,” Wallace said. Looking to help local students? Check out WTOP’s guide on where to donate school supplies across the region.